Barriendos, M.; Balasch, J.; Mazon, J.; Pino, D.; Ruiz, J.; Tuset, J. Study of flood events in long historical chronologies is common in different European basins. The main objective of these kind of studies is to describe climatic variability related to hydrometeorological events, but also to detect and reconstruct extreme meteorological events occurring at very low frequencies. 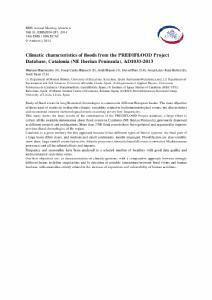 This study shows the firsts results of the construction of the PREDIFLOOD Project database, a large effort to collect all the available information about flood events in Catalonia (NE Iberian Peninsula), previously dispersed in different projects and publications. More than 2700 flood records have been gathered and organized to improve previous flood chronologies of the region. Catalonia is a good territory for this approach because it has different types of fluvial systems: the final part of a large basin (Ebro river), and medium and small catchments, mostly ungauged. Flood factors are also variable: snow thaw, large rainfall events (advective Atlantic processes), torrential rainfall events (convective Mediterranean processes) and all the related effects and impacts. Frequency and seasonality have been analyzed in a selected number of localities with good data quality and multicentennial scale time series. Our first objectives are: a) characterization of climatic patterns, with a comparative approach between strongly different basins to define singularities and b) detection of possible interactions between flood events and human land use, with anomalies strictly related to the increase of exposition and vulnerability of human activities. Barriendos, M. [et al.]. Climatic characteristics of floods from the PREDIFLOOD Project Database, Catalonia (NE Iberian Peninsula), AD1033-2013. A: Annual Meeting European Meteorological Society organised with European Conference on Aplications of Meteorology. "EMS annual meeting : fourtheen annual meeting of the European Meteorological Society (EMS), tenth European Conference on Applications of Meteorology (ECAM) : Prague, Czech Republic : 6–10 October 2014 : abstracts". Praga: 2014.